Linda came to The Movement Centre in 2008, after she lost mobility in her left side due to multiple strokes and heart attacks. 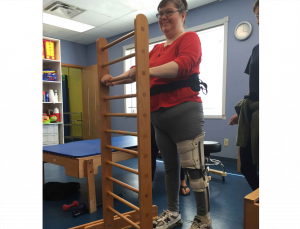 Linda wanted to improve her mobility, balance, and confidence. Her first goal was to transfer to a standing position with confidence. With the help of Conductive Education rehabilitation, Linda’s balance and self-assurance improved exponentially. She was able to accomplish this by working on tasks that focused on challenging her to actively think about the position of her body and actively engaging both her legs at the same time. As Linda achieved her first goals, she started working on new ones: transferring from her wheelchair onto a plinth independently, standing for longer periods of time, walking without fear or being nervous, and improving her balance. Linda’s future goals are to improve her endurance, stamina, and strength while walking. Linda has accomplished so much at The Movement Centre. Every time Linda reaches a milestone, we reach that with her. She’s become part of The Movement Centre family. Linda is grateful to everyone at The Movement Centre who has helped her on her journey, and we are all grateful for her smile and positivity!